A classic recipe of soup kharcho involves the use of beef. But because of modern cookery all the more inclined to variation, cooking it in chicken broth is no longer a nonsense. Soup kharcho chicken – rather, it is a reasonable compromise between rich, hearty and dense first course (in the best traditions of Georgian national cuisine) and the ability to reduce the high calorie meals with chicken meat. The recipe is not accidentally called "Family". There are no sour bases, hot and pungent spices, so it can offer for lunch. Chicken cut into pieces, add to the pan, cover with water and cook on medium heat under a lid for 30-40 minutes. While cooking the chicken, peel and finely chop the carrot, onion and garlic (2 cloves of garlic, leave for refueling). Melt in a pan the butter and fry in it the carrots and onions for 3-4 minutes with constant stirring. A minute before the end of frying add the tomato paste and garlic. Simmer, stirring from time to time, over low heat for 5-8 minutes. Rinse the rice under running water and add to the pan after 10 minutes, add salt to the broth. When the rice is ready, put the steamed vegetables in the pan. 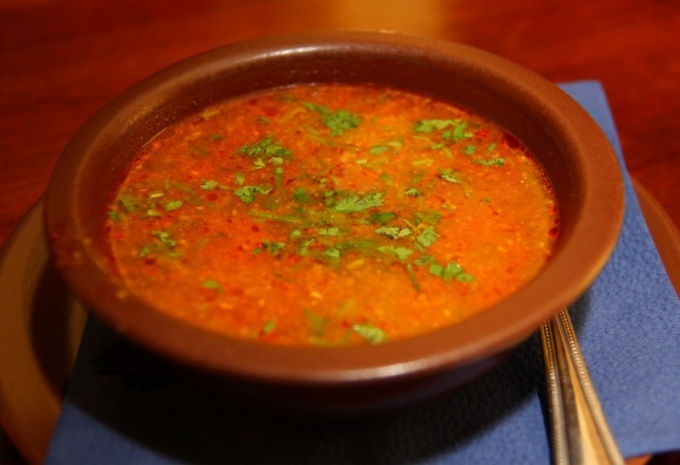 Serve the soup kharcho with dressing that you prepare: peel and chop the garlic, rinse and finely chop parsley. Mix the garlic with the herbs, salt, and remember the mixture in the mortar to drain juice. When serving, sprinkle the seasoning in the soup kharcho, laid out on portion plates. Under acidic base means tkemali sauce, pomegranate or tomato juice, mashed sour berries or fruits. The set of spices is optional, but mandatory saffron, cloves, black pepper and Cayenne pepper (pod). Have the chicken in pieces, cover with water so that it barely covers the chicken pieces, put on the fire. Once it boils, remove the foam, reduce the heat to the Pacific, cover the pan and cook for 1 hour (preparation of kharcho soup this recipe allows for the addition of water to the pot as it is boiling). Peel the onions and chop, add it to the broth and cook for another 10-15 minutes. Then attach the acid-based and lemon juice. On very low heat simmer the soup for 10 minutes. Meanwhile, prepare the nuts and spices. This is a little nuts grind in a blender (not too finely, not into a flour) and spices, pour the boiling broth in a separate bowl, cover and leave for 10 minutes, then strain. Stir in nuts and pour infused with spices and strained broth to the pot. Stir, turn off the heat and let stand the soup under the lid for 15-20 minutes. Before serving, sprinkle kharcho chopped fresh herbs.